A bike basket can be just the ticket for, running to the grocery store or, doing a few errands. 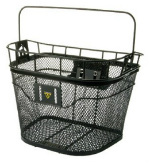 Many bicycle baskets have quick releases so you can take them off and carry them into the store with you. And, you can just leave them off of your bike when you don't need them. Some of the current designs are kind of retro and some are nothing like the old styles. Running some errands on your bike is a great way to do some chores and get exercise at the same time. That little jaunt to the post office or library can be a great excuse to have a little fun while you are at it. If you are looking for a higher capacity bicycle basket you can get one that mounts on a trunk rack as shown below.